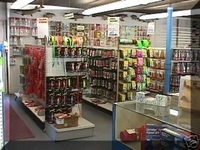 Have you ever dreamed of running your own tackle shop? We're here to make that dream come true. Your purchase includes your own website url (You pick the site), a completely built and functioning webpage that will include all of our products on it, our dealer pricing, sources to get other brands from including Berkley, Strike King, Rapala, and $2,000 MSRP in product to get you on your way. Are you worried about not having any webpage or programming skills? That isn't a problem! Making changes, adding products, adding photos, or changing information is as simple as clicking and inserting. We're using the same software and method that we created our site with, so you'll have a professional looking site. Things To Know: We use Yahoo small business hosting, which is cheap, and what makes the website so easy use, and it costs $25/mo. You will want to get a credit card processor. We suggest PayAnywhere, because you can sign up and be ready to take credit cards in 2 days, and it does not cost anything. As a bonus, we will add you to our "Friends of LLO" section of our page that gets more than 25,000 hits a month. If you don't wish to be added to that section, we don't have to. If you want to add other brands to your site, that is not a problem. The site is yours, and you do not have to only deal with us. These sites are so easy to maintain and run, anyone can do it.